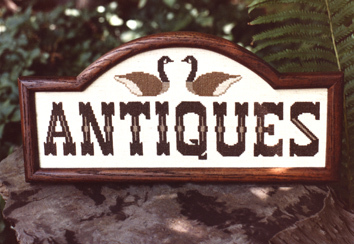 Inspired by antique signs of New England, this design is ideal for any country home or antique collector. Hump back frame is from Hickory Mountain Frames. 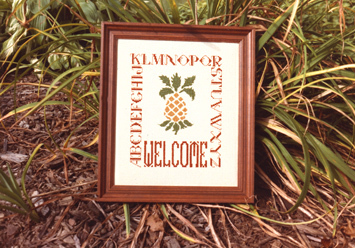 This design includes four charts to create two positive-negative images reminiscent of the 1800 woven coverlets. 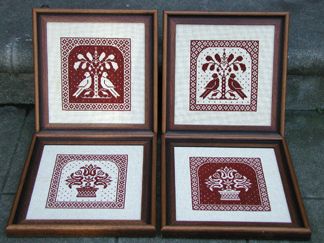 They are beautifully worked on perforated paper, natural evenweaves or needlepoint. 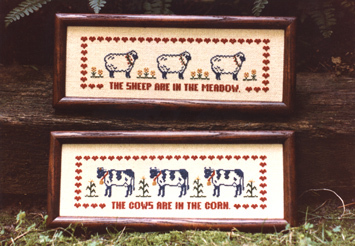 Mother Goose had no idea that the sheep and the cows could be so sophisticated. 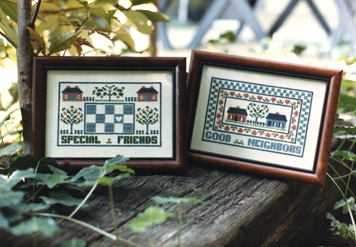 Both charts are included in this package to make a charming pair. This classic pineapple is a great addition to any home. It can be worked in the colors shown or in any color to suit your entry way. Two formats and a complete alphabet are included giving you the option to design your own message in the bottom border. Home sweet home, welcome friends, special thanks, happy birthday, etc.